New Delhi- 110 067 Administration Branch - i Advt. No. 2Admin1/2017. 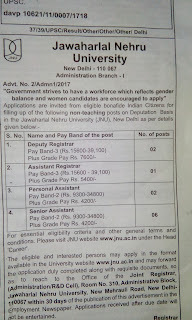 "Government strives to have a workforce which reflects gender balance and women candidates are encouraged to apply"
1).Applications are invited fromeligible bonafide Indian Citizens for filling up of the following non-teaching posts on Deputation Basis in the Jawaharlal Nehru University (JNU), New Delhi . 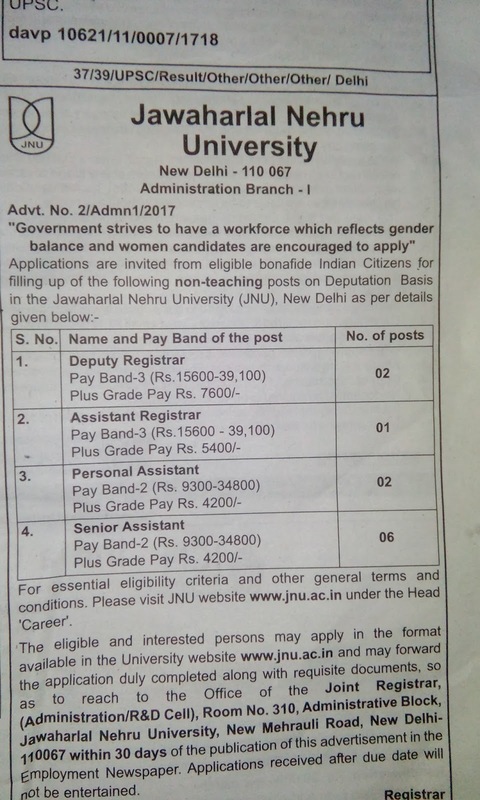 Total Vacancies:- 11 Post . 1. A Master’s degree with at least 55% of the marks or its equivalent grade of B in the UGC 7 point scale. 2. Holding the analogous post on regular basis under Central Government or State Government or Union Territories or Universities or Higher Educational Institutes/Research Institutes /Autonomous Body of Central Govt./State Govt. Nine years of experience as Assistant Professor in the AGP of Rs.6000 and above with experience in educational administration in above mentioned organizations. in an equivalent post. 3. 2. (You will get more information in employment News paper dated on 09/12/.2017 Page no.(03).) Visit the official website for more information.